Since Saturday was such a beautifully sunny day, we decided to take advantage of the uncommonly nice weather by walking along Kits beach to Granville Island. 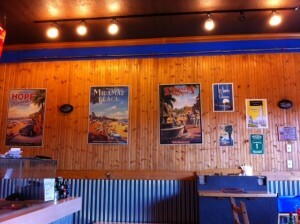 Famished from our stroll, we stopped at the Taco Shack on Cornwall for a quick lunch. 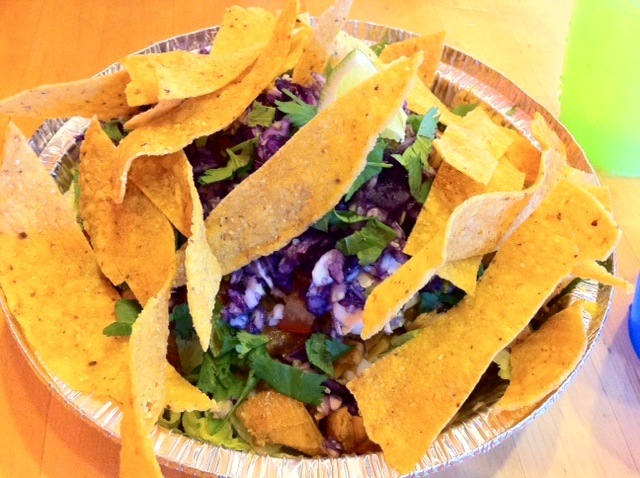 The Taco Shack’s minimalist menu offers California-style tacos, burritos, and quesadillas. My Taco Salad ($5.59 including tax) with added chicken ($1.96) was served a tin container similar to taco salads I had previously ordered at Chronic Tacos on Broadway and El Taco in HK. The crunchy yellow corn taco strips tasted like they were freshly made in-house, as they did not have that distinctive store bought texture. My salad consisted of a generous amount of diced chicken, minced purple cabbage, chopped cilantro, shredded iceberg lettuce, dollops of guacamole, sour cream, and salsa. It’s a nice touch that they did not charge extra for guacamole or sour cream, as is the case at comparable restaurants. Although I ordered my dish ‘medium spicy’, it tasted very mild. 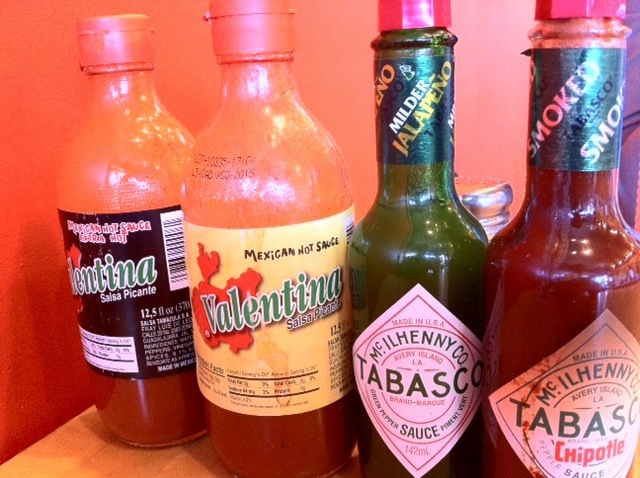 Thankfully an assortment of hot sauces was provided on each table to kick my meal up a notch on the heat spectrum. Three Tacos ($8.95) were served with two soft tortillas shells per taco. Selection of protein: chicken, steak, or fish with your choice of toppings. We ordered our tacos and taco salad with “everything”. Don’t be alarmed – you’re not looking at an excessive amount of raw red onion, it’s actually handfuls of cabbage. Other toppings included heaps of roast corn, cheese, cilantro, salsa, guacamole, and sour cream. 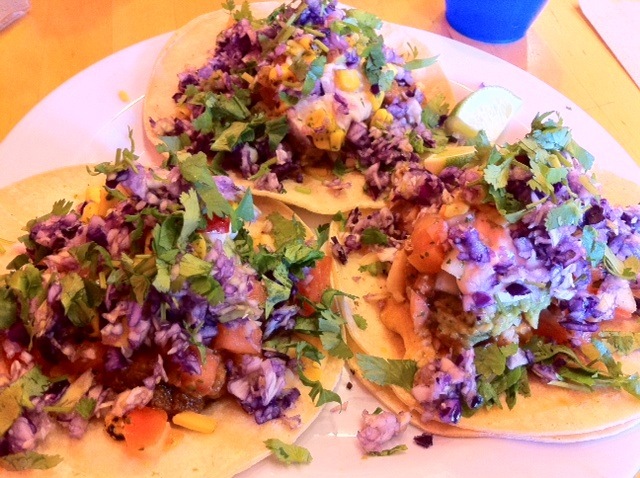 These tacos were generously covered with toppings for those who appreciate large portions and have healthy appetites. Taco Shack is a casual cafeteria style establishment where you place your order at the counter, grab your cutlery and napkins, snag a table, and wait for your tacos to be swiftly made. Complete with vintage California posters lining the walls, this Taco Shack’s decor was going for a taco-meets-surf-shack type of look. Granted, the Taco Shack doesn’t serve the best tacos we’ve ever had, but their portions are large, and it’s a good spot considering Tex-Mex options are slim pickings in Vancouver. Also, compared to Chronic Tacos, this shack was much cleaner and ingredients tasted considerably more fresh. If you’re feeling peckish and happen to be near Kits beach, you might want to check out the Taco Shack. Don’t expect authentic Mexican food, this is SoCal style grub.